First of all let me introduce myself. My name is Milena Origgi. 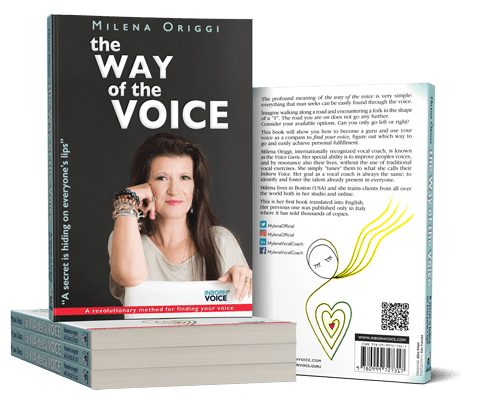 I work as a vocal coach in Boston (U.S.A) and I want to thank the University Cattolica and professor Roberta Virtuani for the opportunity to speak about the hidden powers of the human voice and its implications in this Communication Skills course. Poor communication skills can result in missed opportunities in life as well as professional and personal frustration and failures. But the good news is good communication skills can be trained! Probably some of you will feel uncomfortable because of the so-called “language barrier”, but right now by taking this course in English you are already bringing your communication skills to a new level! You can study a foreign language perfectly in class, even pass the Test Of English as a Foreign Language (T.O.E.F.L) with good results, yet, when the Voice takes over, in the real world, with real people, the game changes. All you knowledge seems to vanish and you feel like you are no longer able to express your thoughts. Everyone has experienced this difficulty in learning a new language but the same happens with all the others communication skills, even in your mother language! We are all capable of becoming a great communicator in any language just don’t take your vocal abilities for granted. 1) Sufficient intelligence and knowledge. This sounds obvious but is not! We are the only beings able to communicate in a such complex manner! It takes us many years just to start speaking complete sentences and more than a decade to speak fluently! You have trained yourself in the art of communicating to the others what you feel inside, by trial and error, through observation and endless repetitions. If you think that speaking is simply pronouncing words in sequence you are oversimplifying! The verbal communication is the topmost layer of a very complex reality! You have learned a full set of unconscious communication skills the pre-verbal and if you want to develop fluency and mastery in the art of speaking, you must train to recognize and control all these aspects. The remarkable differences between our vocal apparatus and that of primates is not anatomical. What makes us different is our neurological capability to control the movements required to produce all the phonemes in the correct sequence and speed. This activity has required years of training! To master this skill you have to learn how to control your voice to make it sound colorful, expressive and able to transmit emotions! We speak by controlling the flow of air in our vocal apparatus if we could not control our breathing we would not be able to speak! What makes us different from other primates is again our neurological capability to control our breathing. And guess what? Also this has required a long training! Your breathing is deeply related also with your emotions. While you speak, if you are not in control, you may be gasping for breath, flushing or even sweating! All these factors will influence the outcome of your communication. Don’t worry! Even these can be retrained! This is the last point, but it is in fact the most important one. Your voice has been trained through your ears, and almost all your communication skills are the direct result of the work of the mirror neurons during your childhood. Now that you have reached maturity, your mirror neurons are overwhelmed by your fully developed mind and learning how to better use your voice require effort! All these factors are the reason why you may find yourself in trouble when you have to speak or to listen. A good preparation, like this course, is necessary in order to avoid unintended result. If you want to be a good leader, a brilliant communicator, you have first to get rid of all the counter productive skills you have already developed. This will be the most difficult part. Once sorted out the issues, you can substitute them easily with the appropriate skills. This is just a glimpse of what is hidden inside the human voice. Training is the key to achieve a good level of communication in your life. Most of the time, when you don’t get the results you were expecting with your family, friends, loved ones or in the study and work environment it’s because you’re missing some voice skills! Learning to use your voice more effectively will surely bring relief! the success in your life and in your career is there waiting for you! Every one of them is still present inside you with their voice. You just have to identify, between so many, the only voice that was born with you, your Inborn Voice! That’s why I have spent years of research on this topic and I have named my teaching method Inborn Voice. Thank you all for your attention and feel free to contact me with your feedback!